Thanks for stopping by today. I wanted to create a post to answer ALL of your hair extension questions! I asked you all on Instagram to send me your questions so I am going to answer the most asked questions here. If you have additional questions after reading this post please leave your questions below in the comments. I was gifted these services but all opinions are my own. I went to The Glossary Salon and I see Leah! Leah is AWESOME and very qualified (she is a level 2 NBR stylist). I trust her fully when it comes to my hair. She also colored my hair if you are looking for someone awesome for hair color. NBR stands for Natural Beaded Rows. Directly from the NBR website (you can check it out here) "The hair extensions are placed in rows in the hair by creating a “track” with an exclusive bead and string technique. Wefts are then placed on the track and sewn in." There is absolutely no glue or head used in this method so the damage to your natural hair is very minimal. They do not slip and do not take long to get installed at all! I personally got extensions for volume and not necessarily length. I might go for length next time but for now I'm loving my shorter hair. I went in and got a consultation with Leah first. We talked about what I wanted to achieve and she consulted me on what would be best for my hair. This took about 30 minutes. I left feeling really comfortable with the process and excited! My actual appointment didn't take long at all. Leah will custom dye your extensions before your appointment so everything is ready to go. I only got one row of extensions and 6 wefts of hair. The entire process for me only took about an hour and a half. She blended the extensions with my own hair by having me stand up and she cut my hair to make it all look seamless. It does not hurt and they are surprisingly comfortable. The extensions feel a little tight for the first 48 hours but then they loosen up and you cant even tell you have them in. 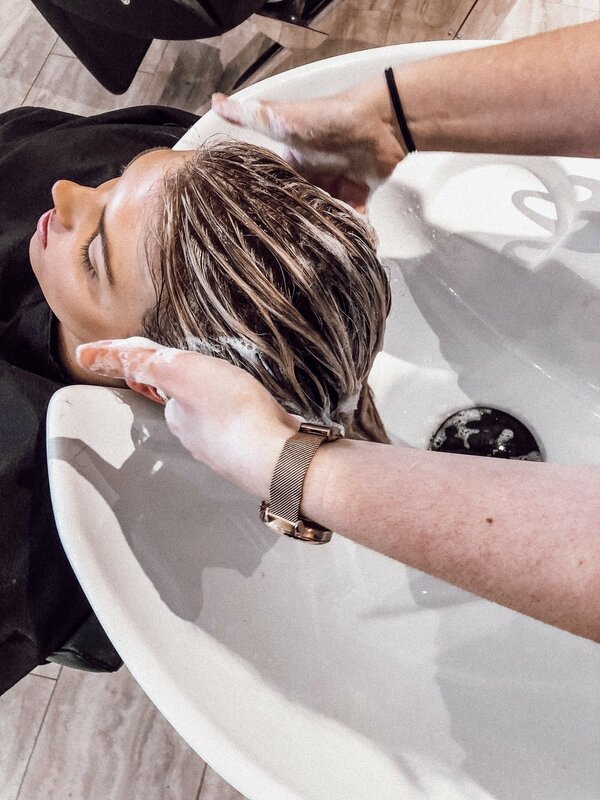 You can wash, brush and style your hair just as normal! And YES you can wear your hair up :). Everyone will be different in this category. I will depend on the length of the hair and how much hair you need. I only got one row of extensions and 6 wefts of hair. I got 18 in extensions and she cut them down to blend with my hair. The cost of the hair and the installation for me was around $600. Again this will vary greatly depending on the person and the amount of hair. You will find out the cost of everything after you have your consultation! A couple of things Leah recommends are a wet brush (which are amazing by the way, ill link one below), oil, shine spray, detangler/leave in conditioner, and a smoothing shampoo and conditioner. You can wash, dry and style your hair as normal but it is important to keep the extensions moisturized and to comb through them every morning and night. I went to the beach with my extensions and I followed all of Leah's recommendations and they did great! It is important to take care of your new hair so it lasts as long as possible. The hair should last between 4 and 6 months and you have to get them moved up as your hair grows every 8 weeks. I hope this was helpful! If you go see Leah for some extensions don't forget to mention my name! I have rounded up my top Sephora sale picks! Below is all the information for the sale.